Nigeria President Muhammadu Buhari, waves after a meeting in Abuja, Nigeria, Jan. 9, 2017. Buhari will travel with three West African heads of state to Gambia in an effort to persuade its longtime leader Yahya Jammeh to step down. Nigerian President Muhammadu Buhari will lead an Economic Community of West African States (ECOWAS) team to hold discussions with Gambian President Yahya Jammeh and President-elect Adama Barrow in the capital, Banjul, Friday, says spokesman Femi Adesina. The ECOWAS team includes Liberian President Ellen Johnson Sirlieaf, who is the head of the ECOWAS regional bloc, Sierra Leone President Ernest Bai Koroma and former Ghanaian president John Dramani Mahama. The meeting forms part of an effort by regional leaders to resolve the political dispute in The Gambia. This follows last month's presidential vote where Adama Barrow was declared the winner. Barrow is scheduled to be officially installed on January 19, despite Jammeh's recent pronouncement that he would remain in power until a Supreme Court rules on his petition challenging the outcome of the election. “It was an assignment that was given to President Buhari by the ECOWAS so it is in pursuant of peace in Gambia and for a positive end to what seems to be a standoff in The Gambia between the incumbent president and the president-elect,” said Adesina. “The incumbent president should have his term expire on the 18th and the president-elect inaugurated on the 19th, and that is what ECOWAS is determined to see, and that is one of the reasons why the presidents of Nigeria, Liberia, Sierra Leone, and the immediate past president of Ghana would be in Gambia." Gambian President-elect Adama Barrow is shown during an interview in Banjul, Gambia, Dec. 12, 2016. It's unclear if the West African regional leaders could persuade Jammeh to hand over power peacefully before the scheduled installation of Barrow. 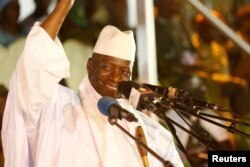 Jammeh disputes the election results, citing voter irregularities. Samsudeen Sarr, The Gambia's acting Permanent Representative to the United Nations, told VOA it would be wrong for ECOWAS to interfere in his country's internal affairs. He insists the electoral commission is to blame for the apparent confusion. “When you have an election and the results are read on the 2nd [December], then three days after the very electoral commission that announced the results came back and said we mistakenly added 63,909 votes to the winner, which made him the winner. But when we subtracted those votes it brought down his number, drastically … Showing that if they added the actual winning number to President Jammeh, he will win with 236,589 votes, 8,881 votes far ahead of Adama Barrow," said Sarr. He also said Jammeh conceded defeat before mistakes of the electoral commission were discovered during the tabulation of the election results. Gambia's President Yahya Jammeh, attends a rally in Banjul, Gambia, Nov. 29, 2016. Jammeh has since appointed a mediator to hold dialogue with the opposition to help resolve the impasse, a move civil society groups say is an indication of his plans to stay in power. It comes despite local and international pressure for him to hand over power. The president also warned regional leaders and the international community not to interfere in the internal affairs of The Gambia. “Don't also forget that before he filed that petition, he had consented to defeat. He had congratulated the winner.” Adesina said. “So that should not be divorced from the fact that he filed a petition. So one thing came before the other. He conceded defeat and he congratulated the winner. That is very significant. Meanwhile, Nigeria's Lower House voted Thursday to offer asylum to Jammeh. 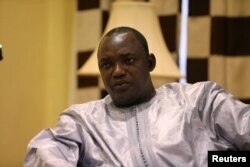 The lawmakers say this could help regional leaders to encourage the Gambian leader to step down. Gambian Civil society groups welcomed the move, but added that Jammeh might not accept the offer if West African leaders put it to him in the Friday meeting.